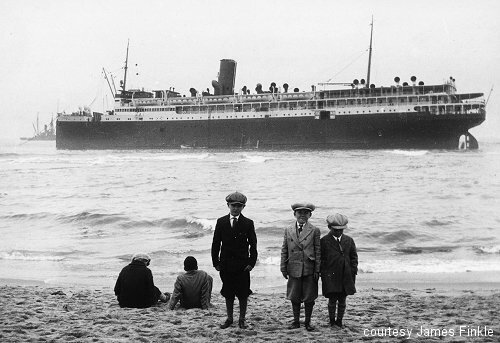 The ten-year-old steamship Mohawk, leased from the Clyde Line to replace the Morro Castle, sank on Jan. 24, 1935, after a steering problem caused her to veer into the path of the Norwegian freighter Talisman off the New Jersey coast. She wrote that during the brief time she was on deck "I had remarked to Sam that all the lifeboats seemed to be buried in show on the decks. Smith said they had to dig the lifeboats out of the snow and ice by hand, and then hoist them out on the ship’s davits. "In those days they were not lifted by machinery. By this time, were aware that a great gash had been made in our side and the ship was beginning to list. We finally raised one lifeboat, got it down the side of the ship and started to move away. 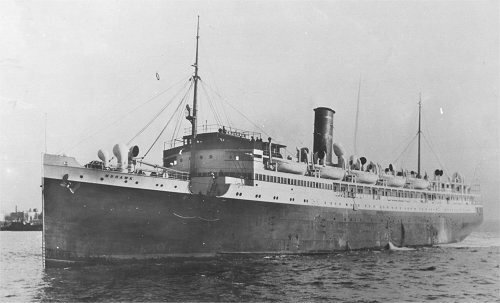 The lifeboat was filled to capacity with passengers and a few crew." As they attempted to push the boat away from the side of the sinking liner, however, they discovered that it was still tied to the Mohawk. "A crewmember started to shout for a knife to cut us away. Sam called to him to tear his coat open and pull out a gold penknife he had in his pocket. . . As it was two degrees below zero, Sam’s fingers were already frozen. The seaman found the knife, ran and cut us loose from the Mohawk. The Talisman struck the Mohawk broadside. The gash in the ship’s steel hull might not have been enough to sink it had it not been for something else that the company had done prior to the collision. Because of the depression, and in an effort to squeeze some extra revenue out of the ship, the watertight bulkheads had been opened for easier loading and unloading of cargo. With all of the bulkheads opened, the ship was doomed the moment her hull was breeched.